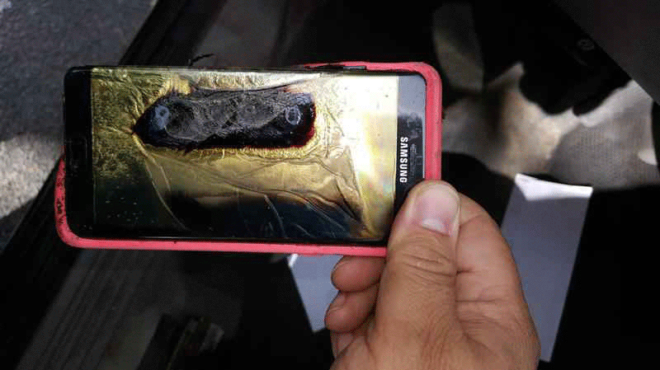 When Samsung started handing out “safe” Galaxy Note 7 phones last month, it was expected that we would be putting the stories of overheating Note 7s behind us. Unfortunately, that hasn’t been the case. In the days after a report said that a replacement Note 7 overheated on an airplane, three more “safe” Note 7s have reportedly caught fire. First, a man in Kentucky woke up at 4:00 am last Tuesday to discover that his replacement Note 7 had caught fire and was smoking. The owner, Michael Klering, got into contact with Samsung and refused to give them the phone, but they did pay to have it x-rayed. What’s interesting is that Klering says that he got a text message from a Samsung rep that was meant for someone else that said “Just now got this. I can try and slow him down if we think it will matter, or we just let him do what he keeps threatening to do and see if he does it.” Samsung never made any official announcement about this Note 7 catching fire. Moving to Friday, a 13-year-old in Minnesota says that she was burned by a a replacement Note 7 while using the device. 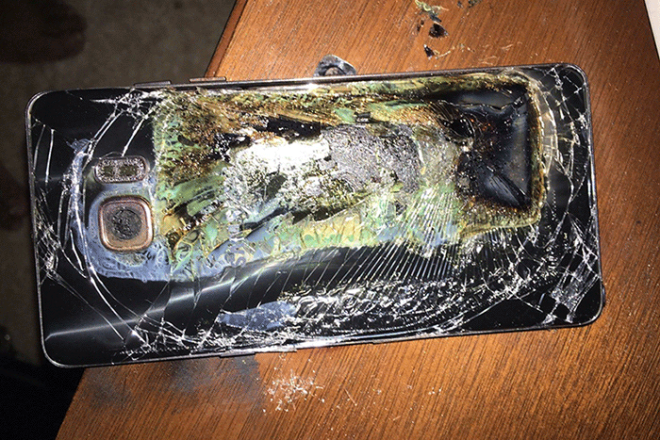 Abby Zuis felt a “weird, burning sensation” when holding the phone, and while she escaped with a minor burn, the phone had been damaged by smoke and fire and also melted its protective case. Finally, a fourth replacement Note 7 is said to have caught fire today, Sunday. Shawn Minter says that his Note 7 caught fire overnight and filled his bedroom with smoke. T-Mobile is still offering replacement Galaxy Note 7 units to customers. If you’ve already got a Note 7 but want a different phone following these reports, T-Mo is allowing Note 7 owners to exchange their phone for a different device if they’ve got concerns about their safety. If you’ve got a Note 7, are you thinking about swapping it for another device? so, who thinks tmo will stop selling the note 7? They all might stop. And i wouldn’t blame them, it’s becoming a hassle for them exchanging devices, offering refunds and all that. bloomberg news broke the story that att is considering discontinuing it. Well look at the bright side, these phones can be given to the military to help fight the war on terror! I didn’t have any problems with my original note 7 and I haven’t had any reason to be suspicious about my replacement note 7. I did the same things that I did with the original… Charge it with a aukey charger and cable while keeping an eye on it just in case… No smoke, or excessive overheating or anything out of the ordinary… With that being said if this whole note 7 thing gets the official shutdown I guess the V20 will be my only option as no other phone out there can come close to what the note can do… I don’t want to be stuck with a phone that I can’t resale or have any type of backing from the oem or carrier if something other than the obvious goes wrong with the phone and I need to make an insurance claim… I couldn’t see them helping out with a official recalled phone down the road. it might not be supported well with security updates and such by sammy, either. get rid of it. All these other people weren’t having problems with their phones, even doing the same things you’re doing, before their phones burst into flames. Just because it seems fine doesn’t mean it is. All these people? You mean the 4 out of 2 million? Yeah but.. .. yeah. Its an option. s7, s7edge, iphone7? do you really NEED waterproof? I traded up from the S7E for (in rough order) the onboard storage, the screen (larger, same high-res, less of a curve) and the pen (I actually use it to take notes periodically) without losing the camera or waterproofing. On tmo, so my options for onboard storage are “here is the tiny one and good luck!” On the s7e it was unbearable – adopting the sd was super unstable, and with it ‘standard’ all app updates automatically move back off the SD. So instead of clicking “update all” and wandering off every now and then, it was “update all” .. make sure it finishes.. then move all those apps back to SD. Or repeat that process over and over if it runs out of storage along the way. Unfortunately, it looks like the V20 on TMO is going to have the same problem – “32G” plus sd, no options for larger versions. i’ve seen 32g mentioned in a couple reviews. i don’t know where they are getting that, either. AT&T no longer issuing replacement note7s. “(RTTNews) – AT&T Inc. ( T ) said Sunday that it will stop issuing replacement Samsung Electronics Co. Galaxy Note 7 following reports of fires from the replacement devices. AT&T said Galaxy Note 7 customers can return their phones for different models while Samsung and U.S. safety authorities investigate why several phones melted in the past week.”. I don’t care if you haven’t had any issues yet with your Note 7, if you keep it just to push your luck then you’re putting yourself, your family, and possibly me in danger. Your phone could ignite in your sleep. It could ignite on my flight. It could ignite at your office, on your commute, in a movie theater, etc. This isn’t just about you – this is about everyone around you as well. The responsible thing to do with this device is to power it off and exchange it at your carrier for another device that won’t be a hazard. If you don’t care about your own health, think of your kids or someone else’s. I didn’t know that AT&T was “handing” out GN7’s. If that’s the case, give me one. they aren’t dealing in them at all, now. see my post below. I want to swap mine so badly but I won’t settle for a 32 GB phone. The problem is, the Note 7 is the only 64 GB phone T-Mobile stocks until the V20 comes out. They stopped carrying 64 GB models of the S6, S6 edge, Note 5, and S6 edge +. I want to keep with Samsung because I really like Samsung Pay but my only hope now is if I can find a nearby T-Mobile store that still has a new phone in stock. you’re basically screwed right now. the new models are out of stock or not released, yet. Samsung Pay isn’t much different than Android Pay so it doesn’t necessarily have to keep you from looking at other options. First, Samsung Pay has MST which is beautiful because it can emulate a magnetic card swipe and it actually works. Android Pay only has NFC, which Samsung Pay also has. Second, I use Capital One and, at the moment, Samsung Pay is the only mobile payment platform on Android that supports them if you don’t want to use Capital One’s wallet app. I think it’s funny. People not heeding the warning signs with devastating effects. It’s no longer Samsung’s fault, if consumers fail to obey guidelines from a major company. I’d agree with you on people holding onto their unexchanged phones but these are supposedly “safe” replacements. Anybody considering holding onto any of the Note 7s after this is an idiot though. I have no issue with the exchange program. Samsung dropped the ball big time with rushing a product to the market without safety measures in place, and heavily advertised during the Rio Olympics. well the note 5 started that trend because Samsung wanted to rush and get it to the market before the IPhone 6s at the time. Note 4,3,2,1 all were usually introduced at IFA Berlin which is usually the first week of sept. They are all then subsequently placed for sale around late OCT-Nov the note 5 changed that and the note 7 seems rushed to stop some of the coming iPhone 7 thunder. Remember Samsung makes a ton of components that go into the iPhone they make the a10 chip the ram and some other bits so I’m sure they have an insider track as to specs and release date and I’m sure this effects their product cycles also since they consider apple their number one competitor. it’ll be funnier when they come back saying it burnt their house down. Samsung, and carriers warned users of free exchange program no hassle. Cannot help stupidity, a security guard at my work , was stubborn to make that exchange. I can assure you he got a ear full from his wife, with a baby in there house. Just returned my replacement. It was getting hot everytune I charged it. One tI me while chargng it got insanely hotand started boot looping. I’m done. Bad thing is is that no other phones interest me. I think I’m gonna try a Huawei Mate 9. Every single Note 7 should be recalled and the line discontinued at this point. Samsung should also discontinue update support for the device to further encourage people to give up their time bombs. This doesn’t only effect you, it is a public safety hazard as well. You endanger everyone around you, even those you love. Note 7: the Donald Trump of smartphones. Just when you think they’ve finally gotten it to behave, it goes and blows up in somebody’s face again. trump is going to win in the end, though. obviously you didn’t watch the debate tonight. hillary got spanked (she did give her consent by showing up). We’ll see next month, won’t we? yep. there’s a long ways to go. and lots for wikileaks to dump. The averrage trump supporter will never read the emails Wikileaks puts out and I don’t know how you think he won a debate when he couldn’t answer a single policy question without blaming Obama and shying away from talking about his actual plans. obviously, you didn’t watch the debate. and you mean the average hillary supporter will never know about the wikileaks because the biased main stream media isn’t reporting them. it was all over the news yesterday. I did watch the debate, i heard a bunch of personal attacks from both of them , and trump who couldn’t answer one question on his policy proposals. People who care about how their lives will be affected would be wise to want to hear about the policy proposals such as taxes, national security, and cutting down our nations deficit. Till i hear something other then i’m going to force mexico to pay for a wall and i know more then all of the generals blah blah statements. I’ll take my chances in saying Trump probably won’t win anything . all over the news? lol. ok. like i said, obviously you didn’t watch the debate. Ok guys, enough of the political talk and back on topic, please. It only counts if you stomped your feet when you typed that! Here’s the solution to avoid blow ups: 1st: don’t use wireless charging pad cuz it causes too much extra heat. 2nd, turn off fast charging in battery/optimization settings….it will still charge quickly but not create unnecessary heat and actually increase your battery’s life span. I hope that’s all sarcasm..
Everyone shut up.. we’ve got the expert and engineer SeanBear here to explain what Samsung’s engineers didn’t think of. Everyone listen and take notes. There’s no point in keeping mine, even if I’ve had no problems, because they won’t support it, which means it probably won’t be updated. I came back to Samsung for this phone, once they came to their senses and put the SD card back in. I’ll wait until the V20 comes out, then I’ll be going right back to LG, smh. Can we expect this phone to be worthless when it comes to resale value. Might be a collector’s item at this point. Is it me or should they have stayed with the exynos processor for the note line. It’s already known the snapdragon Version lags quite a bit and maybe has something to do with this as well. I’m just throwing ideas in the wind I mean my note sometimes keeps a charger plug in it when I fall asleep to Netflix and I wake up and touch the phone and it’s cool. I love my phone and I know alot of people who loved the note 7. The s8 and note 8 have to win next year or it could damage the mobile brand of Samsung. I think a lot of people don’t turn off fast-charging when they leave It plugged in. I haven’t had any issues because I turned off fast-charging. The Samsung Galaxy Note 7 line needs to be discontinued and customers refunded. It is a dangerous phone and apparently Samsung does not know what is causing that phone to catch fire since the replacement phone is having the same issue. The poor cant afford it for there kids. Best way to burn the note 7.